Who doesn’t love a quick, easy, healthy and super delicious dinner?? 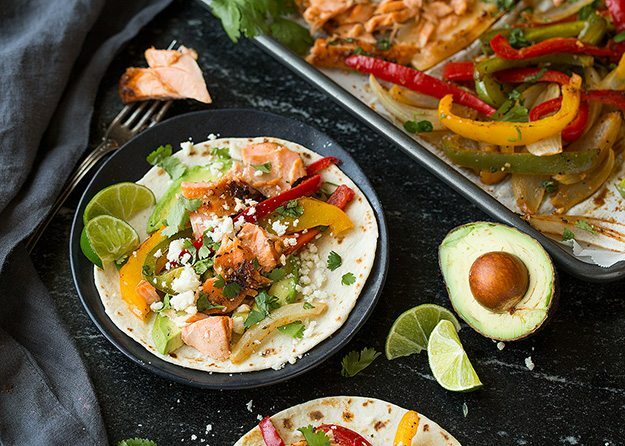 These Sheet Pan Salmon and Avocado Fajitas have got to be one of these easiest dinners you can make yet you end with a such a tasty and satisfying meal! You don’t even need to skin salmon or cut it into smaller fillets for this recipe. Just add the whole portion to a baking sheet, slice some peppers and onions and add those as well. Add in a little oil, sprinkle everything with fajita seasoning then pop it in the oven and roast it until it’s all cooked through. Then you just spitz in some fresh lime juice and sprinkle in cilantro (or even add those ingredients to each individual serving). 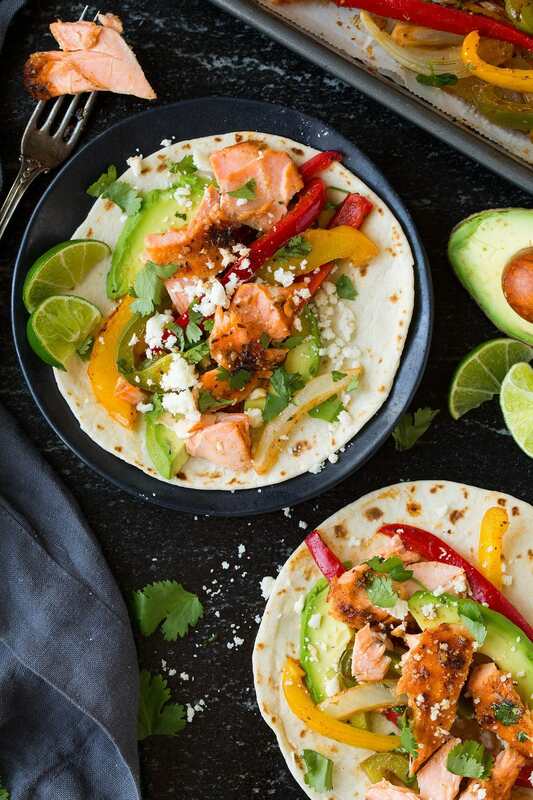 Add all that goodness to warmed tortillas with your desired toppings and you’ve got dinner in 30 minutes or less (to make the best use of time, and so you can eat everything warm, prep the avocados and toppings while the salmon and veggies are cooking). Trust me, this is a meal you’ve gotta try! I love Southwestern and Mexican food so I love a simple meal like this that’s full of those fresh flavors. And even better, a meal that’s so easy to make! Plus, have I said yet that clean up is a cinch? Because obviously that’s one of the best parts of this meal, next to the awesome flavor of course. 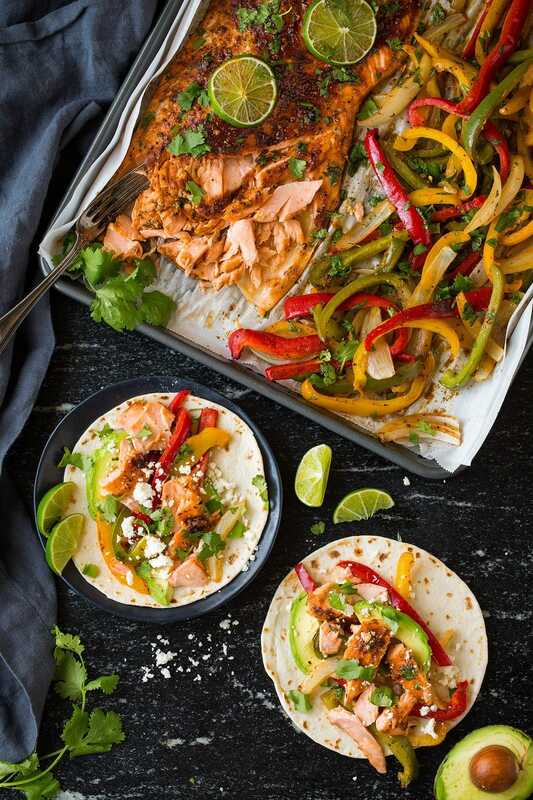 An easy flavorful salmon fajita recipe that you'll love for busy weeknights! 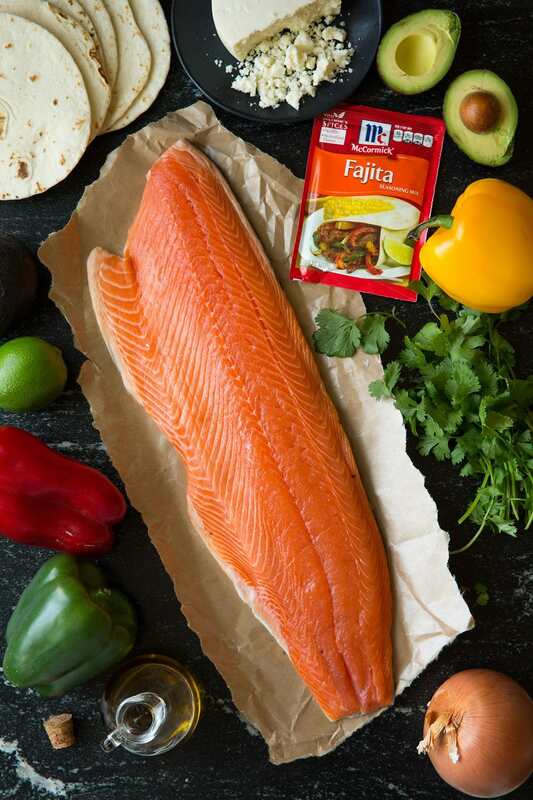 Just brush salmon and veggies with oil and season with spices, then roast in the oven and serve over warm tortillas with desired toppings! Preheat oven to 400 degrees. Line an 18 by 13-inch baking sheet with a sheet of parchment paper. Place salmon on one side of the baking sheet, skin side down (mine was a small side of salmon, if using a wider salmon portion you could place in the upper 1/3 of the baking sheet). Place peppers and onions next to salmon. Brush salmon with 1 Tbsp of the olive oil. 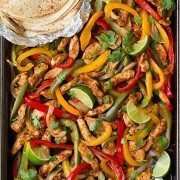 Drizzle and toss peppers with remaining 1 Tbsp oil. Sprinkle half of the seasoning mix evenly over salmon (2 Tbsp) then sprinkle remaining half (2 Tbsp) over veggies and toss. 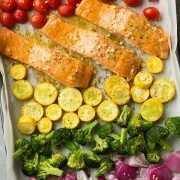 Roast in preheated oven until salmon has cooked through and flakes easily with a fork and veggies are tender, tossing veggies once halfway through cooking, about 20 minutes total. Spritz salmon and peppers with juice from the lime, season with salt as desired and sprinkle with cilantro. Flake salmon with a fork. To assemble, layer avocado slices over warmed tortillas. 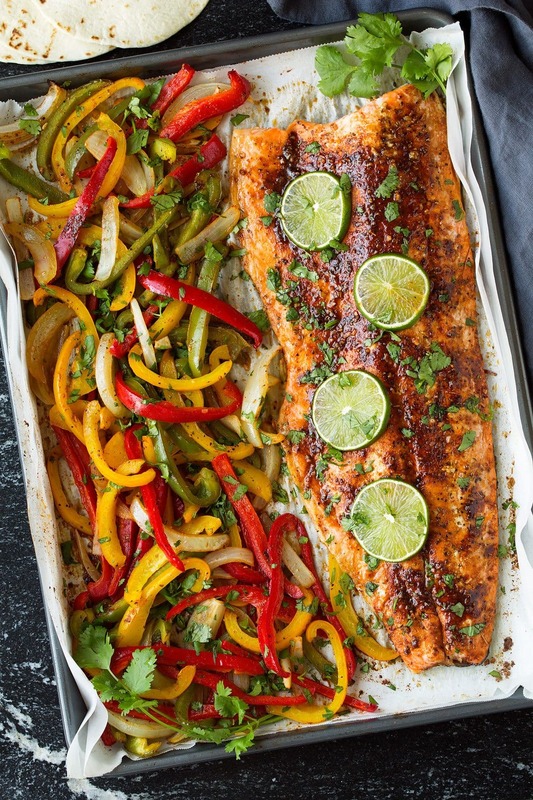 Top with flaked salmon, peppers and onions. Sprinkle with cotija cheese and serve with sour cream and hot sauce if desired. charlie: looks great, I love salmon and its endless variations! thank you for sharing! Paige: Yum! 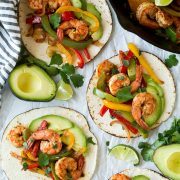 Totally making these for dinner this week!